I was at a Greek restaurant with a couple of friends last January and the food was so good that we decided to go to Greece to get more. After dinner we went to my house and booked airline tickets and a hotel for a week. No joke – it happened just like that. Explaining to our husbands that we had just booked a spontaneous week long trip to Crete took some finesse, but to their credit they were quite understanding. Each of us paid just 180 Euros for airfare and accommodation for 7 nights. Here’s what we did on our action packed 7 days! Day 1: Arrived in Chania via Ryanair, retrieved our rental car, had a brief encounter with goats, and drove to the town center for a delicious and abundant lunch in the central market. Afterward we drove to our hometown (for the week) of Kissamos, checked in and then had wine and girl talk on the beach. Because that’s what girls do. Day 2: Since we didn’t have any concrete plans for the day, we asked a local who suggested we drive through the most beautiful olive tree-covered hills to the beach of Elafonisi. So we did! There are no words to describe how beautiful it was. 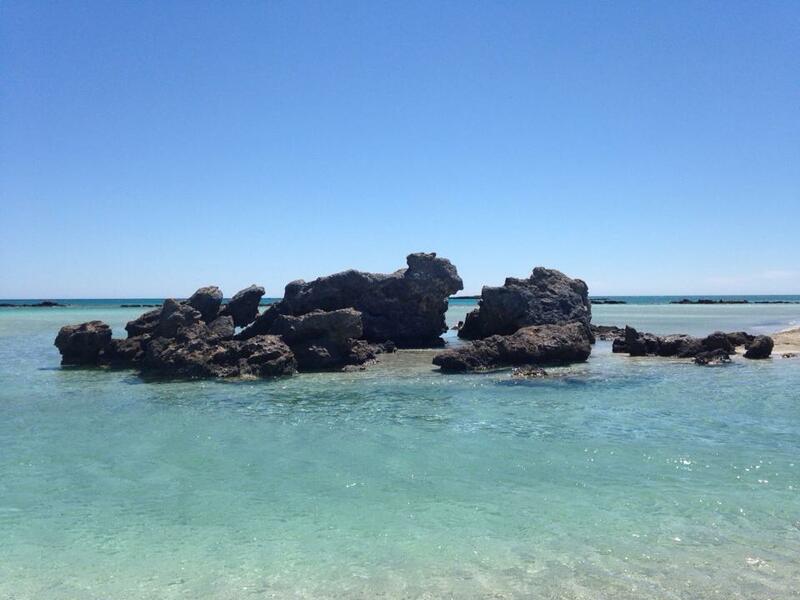 The most crystal blue, shallow water…a different hue than the Carribean but no less beautiful. 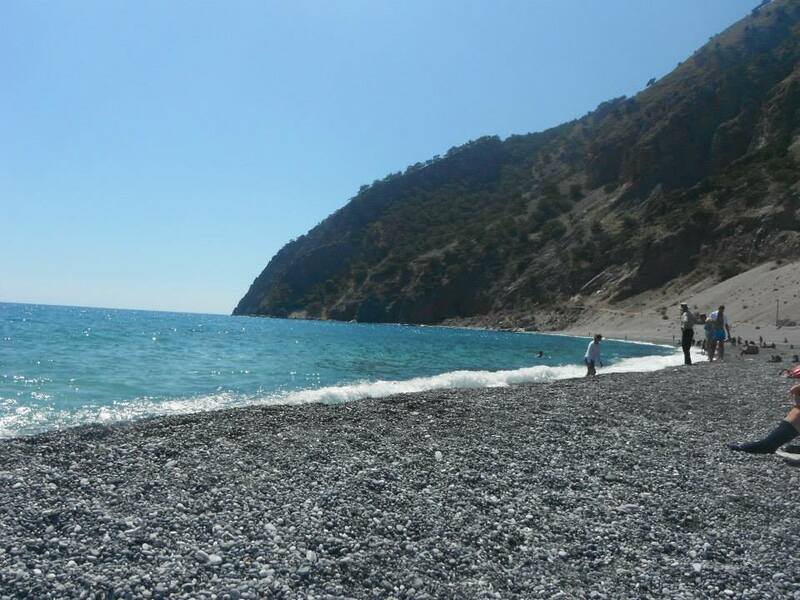 Afterward we drove north along the coast where I was stung by a bee in the car (pack your epi-pens!) 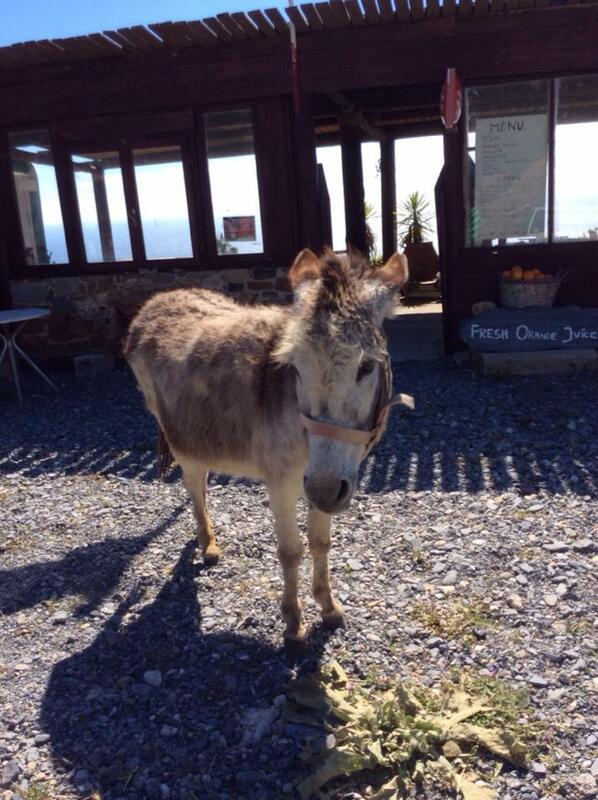 and when we stopped so they could pull the stinger out of my back we were greeted by the world’s friendliest donkey. Random experience, but I wouldn’t have it any other way. We stopped again at Falasarna, the westernmost tip of Crete where we ate a dinner fit for queens and watched the sunset. 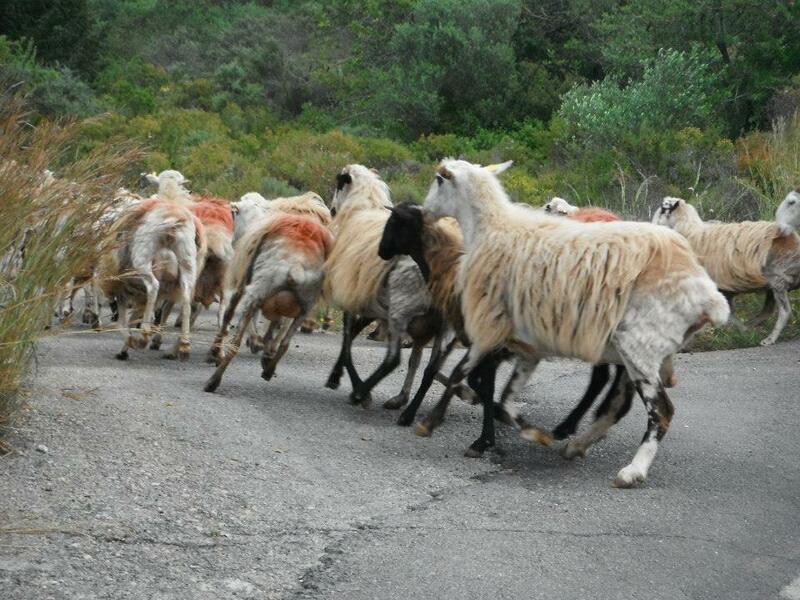 The lamb was so good – probably because the animals graze on the oregano and thyme that grow wild on the island. Day 3: We woke up at 4 am (A.M.) and drove to the bus stop where we would be picked up and driven to the top of the Samaria Gorge, the longest gorge in Europe. To my surprise, it looked and smelled like Idaho. We started out with the shivers and pine trees and rocky mountains, and as we descended, the scenery and temperature changed. 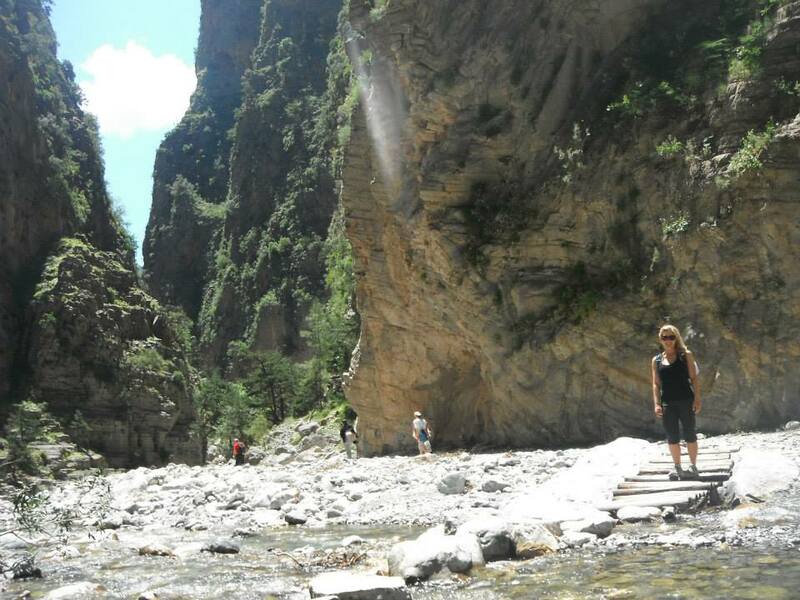 After a 5-hour trek downhill on unstable river rock, we reached the “iron gate” and once we passed through, we were not far from a black shore with deep blue waters called Agia Roumeli. Two important things: First, there were a lot of bees, so if you’re allergic and you go there, pack your epi-pen. Secondly, I wouldn’t do this hike with children under 12. It’s not technically that challenging, but it is long and the footing is unstable. Would I do the hike again? Absolutely! Day 4: It was time for a more relaxing day, so we slept in a little and then went back to really explore Chania. It has old Venetian ports lined with restaurants and shops, and a really charming little town behind it. Honestly, the architecture reminded me just a little bit of Venice but with more sunshine. It’s the perfect place to shop for affordable souveniers. The central market is also great for authentic but affordable food. It’s definitely worth a visit. 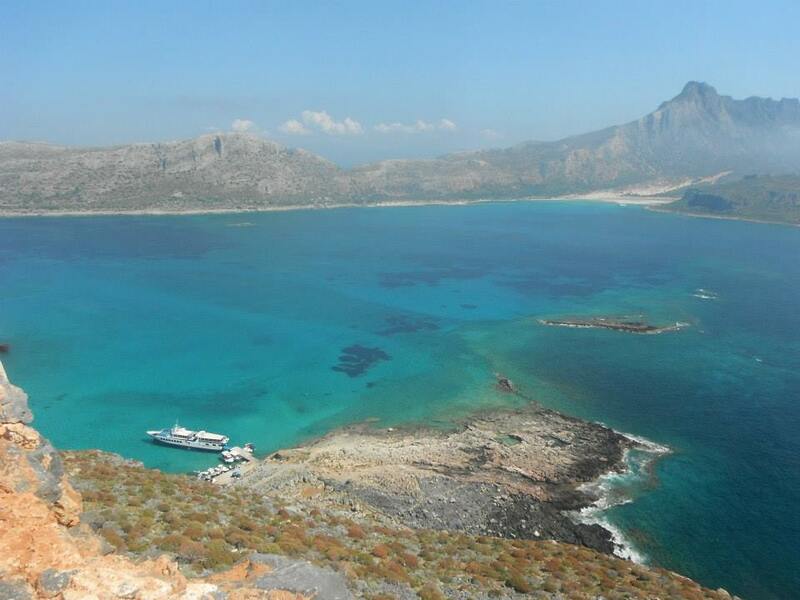 Day 5: The three of us boarded a boat from the port of Kissamos and set off for Balos & Gramvousa Island. 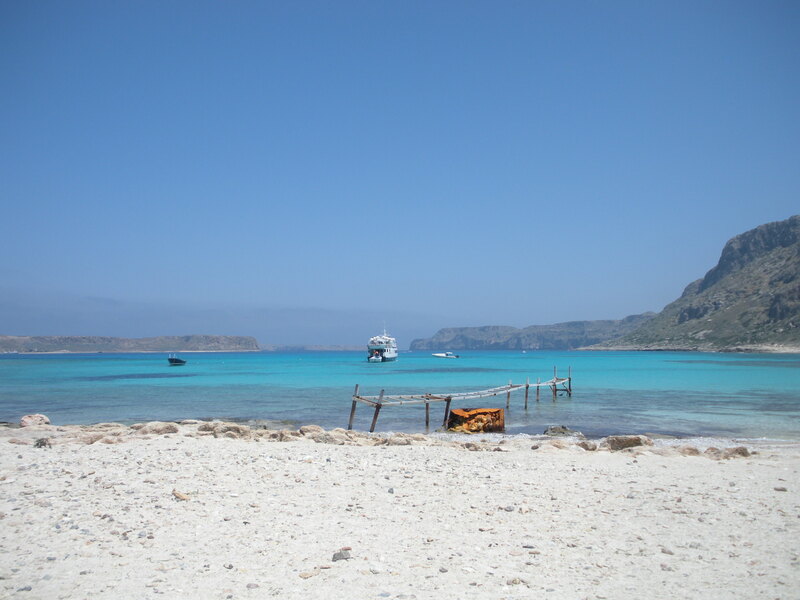 It took about an hour on the boat before we arrived at Balos, where we were allowed to swim to shore. It was quite an experience! (There’s also boat transportation if you don’t like to swim.) If you choose to do the swim, wear water shoes because there are sea urchins on the bottom. Once ashore we pinched ourselves because our surroundings were so surreal that they seemed fake. There is a reason Prince Charles and Princess Diana honeymooned there. It’s stunning. After a couple of hours we boarded the boat and had a delicious Greek lunch of stuffed peppers while we covered the short distance to Gramvousa Island. You can hike to the church at the top or hang out on the beach. I think we paid just 20 Euros each for this spectacular day. 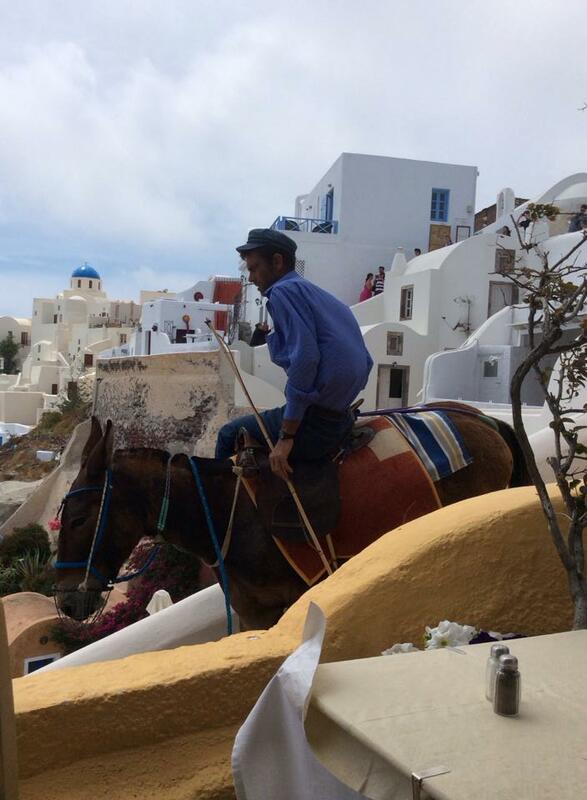 Day 6: What trip to the Greek islands would be complete without a visit to Santorini? We woke up at the crack of dawn and drove to Heraklion to catch the 2 hour ferry to Santorini. Once there we boarded a bus for 2 Euro which took us to Fira (or Thira) and from there we checked in to our hotel. Our host was a 20-something woman who was so kind and treated us like long-lost friends. 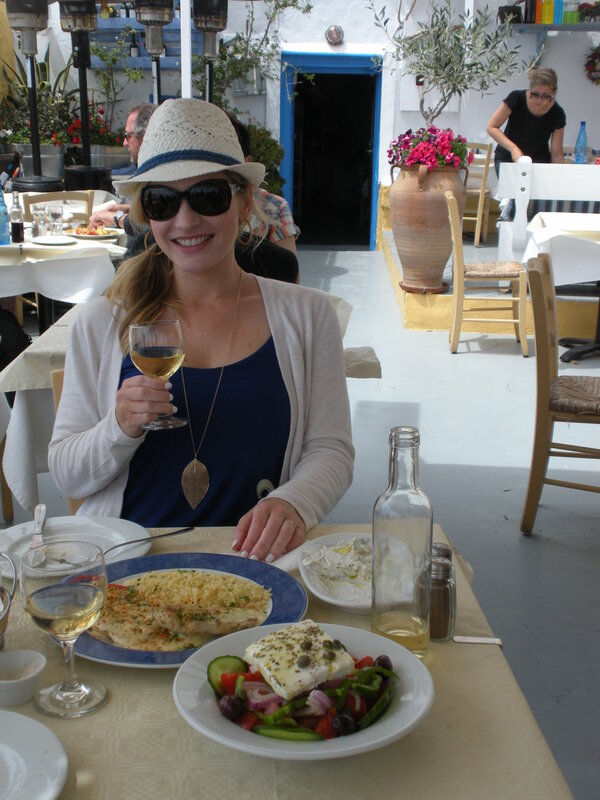 She gave us good suggestions on how to make the most of a 24 hour trip to Santorini. Of course, we made our way via public bus to Oia, the town with the white buildings and blue-domed churches. It really does look like the pictures. After taking in the breathtaking sights and buying a white and blue straw hat (so I could fit in, of course), we ate lunch at a restaurant with postcard-worthy views. At one point during lunch there were more donkeys. I’ve never had so many random donkey encounters in my life. After lunch we walked along the trail that leads from Oia to Fira, taking in the famous sunset. Day 7: It was a little rainy on our morning in Fira, but we still enjoyed an early lunch and then headed down to catch the ferry back to Heraklion. 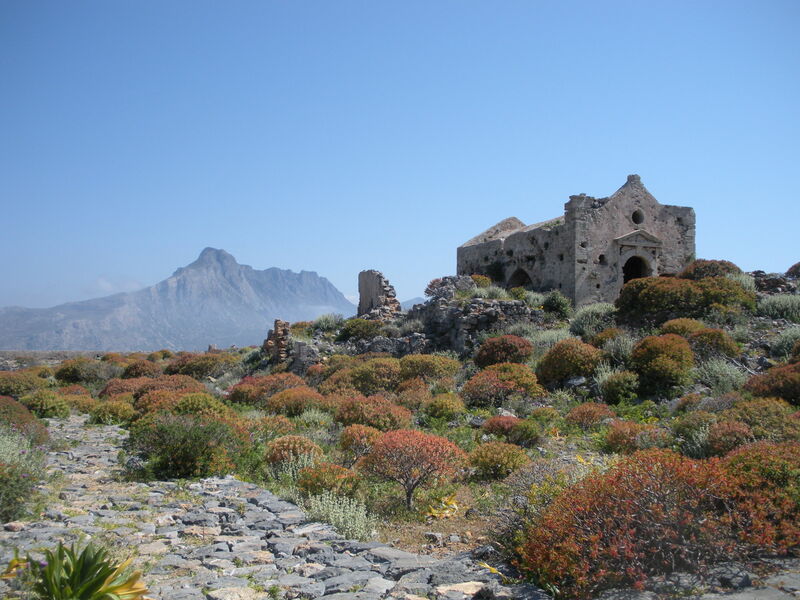 Once at Heraklion we retrieved the car and drove to Kissamos, where we packed up and got ready to leave. Our last dinner in Kissamos was at a local place on the little square where we enjoyed grilled pork souvlaki and fresh vegetables, of course with bread and tzatziki. A “sit by the pool and lounge” experience this was not. This trip was active, which made it memorable. The people were genuine, which made a big difference as well. I’m so thankful that the locals were kind and gave us great advice on where to go and what to see. It wouldn’t have been the same otherwise. I didn’t know what to expect, but it is a very authentic and untouched place. Did I mention it was extremely cheap? 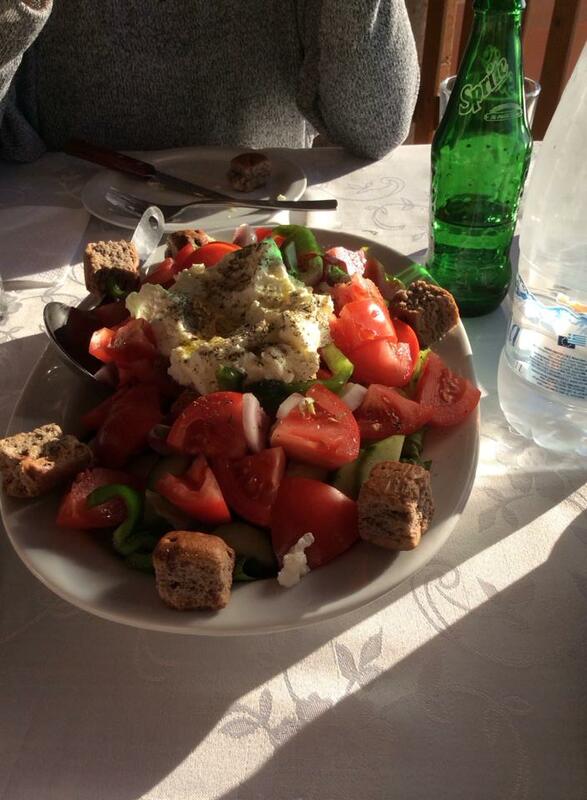 Food in Greece is healthy and affordable, and excursions are definitely within the budget. If you want to connect with gorgeous surroundings, openhearted people and eat delicious food, go to Crete. Once you do, you’ll know exactly what I’m talking about.